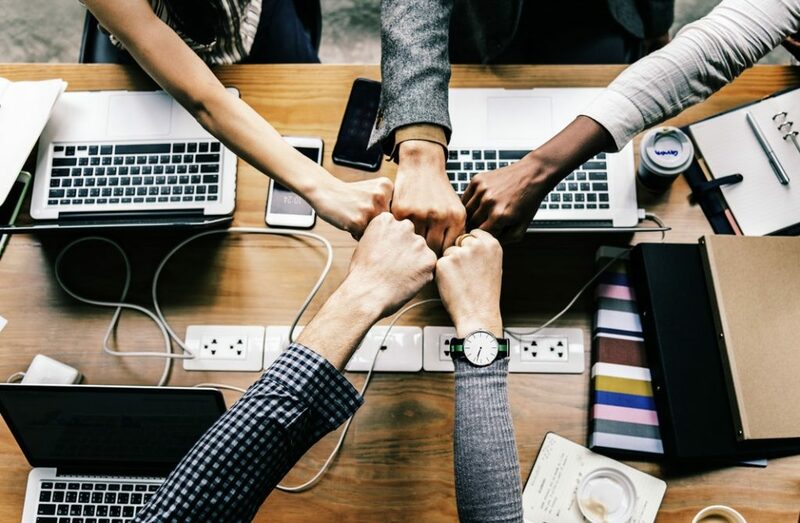 For this article, we decided to gather the internal communications best practices of 2 companies widely recognized for their corporate culture. Moz is a marketing software company from Seattle whose name is ubiquitous in the world of online marketing and has quickly grown to 50 million in revenue yearly. Google needs no introduction. Of course, neither is perfect. Both have had their share of scandals. While Google has been in the news for alleged gender bias and poor work-life balance, Moz made the headlines for laying off about a third of its workforce to avoid negative cash flow. However, both have also stood out as great places to work with singular, remarkable corporate cultures that have become a reference point for many companies. These companies have managed to combine technology and practices which are effectively able to communicate a culture across a large workforce. These internal comms best practices meet the foundations of these companies’ core values and strategic vision. We have tried to study these practices and present them to other organizations looking to learn from them and improve their own processes. What makes Google excel at Internal communications? 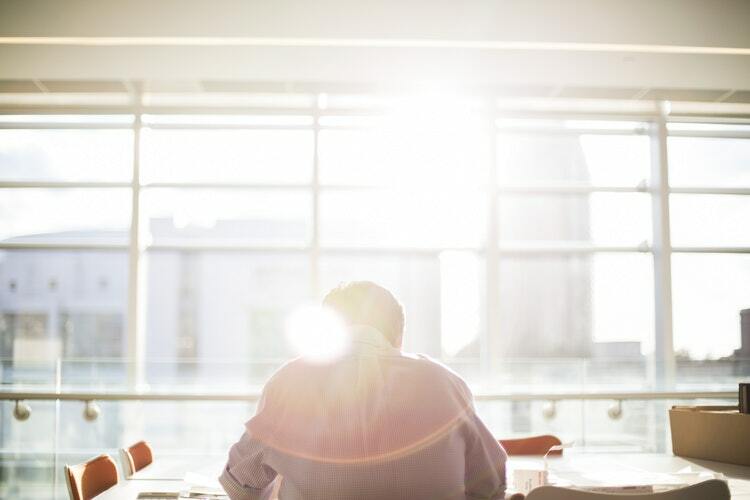 More than focusing on communication channels like emails or intranet software and if team members use them in a daily basis, we wanted to highlight two foundational approaches that they share in their blog Re: Work, where the company documents its journey about how they build a better, more productive workplace. Free food is not the end, but a means to an end. While Google is famous for providing tremendous perks like free food, health and dental care, free haircuts, dry cleaning, subsidized massages, gyms, and even nap pods, they don’t attribute their success to these perks but how they use data to map the appropriate incentive to each employee. Google has a dedicated team for running both quantitative and qualitative research to provide scientific answers to help Google optimize both happiness and performance of their employees. There is no doubt that this approach works: Google consistently ranks as a top place to work each year. However, the most interesting finding in regards of team communications and performance comes from on a research called the “Aristotle Project” to find what made some teams at Google top performers. Julia Rozovsky, from the People Analytics team, shared some valuable insights in a keynote. The Aristotle Project took nearly 2 years of interviewing about 180 teams and involved more than 200 collaborators to identify the factors that made some teams at Google perform better than others. The surprising insight – it had nothing to do with technology and the level of seniority of each individual. Armed with these results, Google created the G Teams program which would try to apply the findings across the organization. Psychological safety was to be a key area of focus as it presented the strongest correlation with team performance. 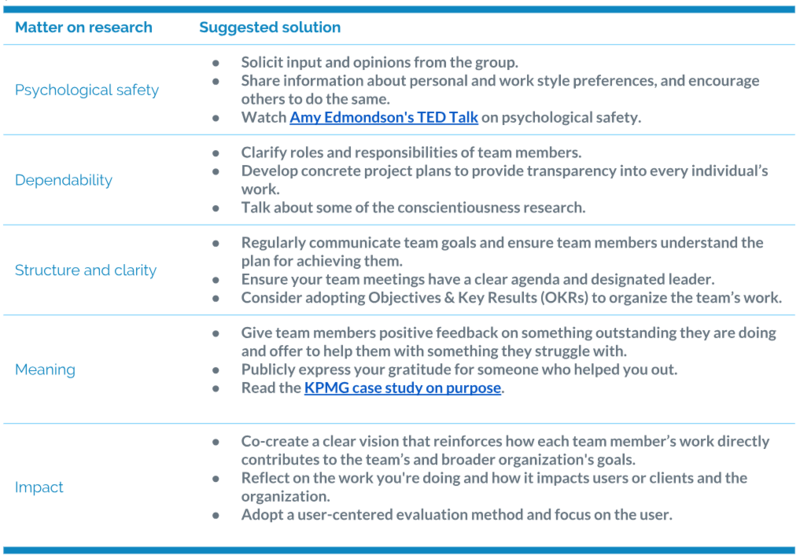 A 10-mins survey addressing the five dimensions listed above to determine teams performance. Next, the results were shown to the team to help them understand how the team was doing in all of these dimensions. Teams would have 90 minutes conversations to discuss results. People operation team offered a set of resources to address each dimension, whenever needed. 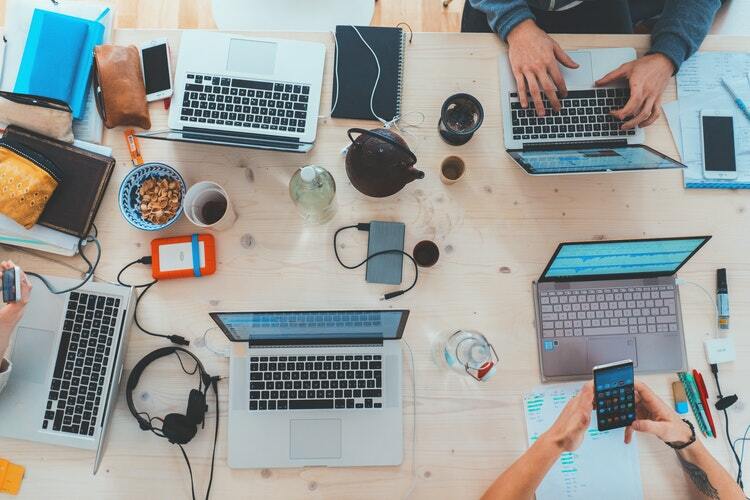 To help remote teams achieve psychological safety, it’s valuable that new teams work in the same physical space while they build their norms, and after that, it doesn’t really make a difference wherever they are. Kicking off every team meeting by sharing a risk taken in the previous week improved 6% on psychological safety ratings and 10% on structure and clarity ratings. 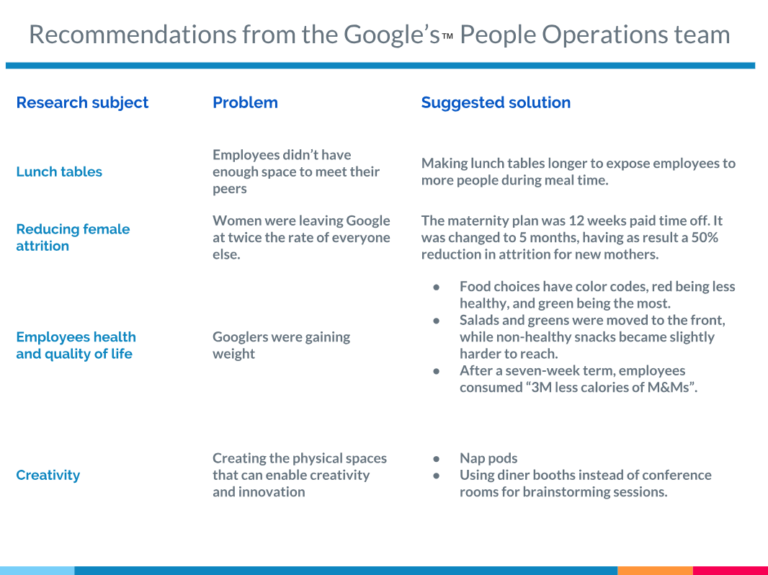 Luckily, Google’s People Operations team wanted to help teams not just by communicating their research results, but helping Googlers –and every organization accessing the information—to go through their own process to identify team dynamics and achieve improvement. Frame work as a learning problem, not an execution problem: make your colleagues recognize there is uncertainty and a need of interdependence; you have never been there before and you need your team’s output to get things done. Acknowledge your own fallibility: enable confidence by acknowledging when you have failed before. Model curiosity: by asking as many questions as possible, encourage your team to express their doubts and questions (i.e. enable curiosity with reciprocity). What does all this have to do with Internal Comms? Internal Communications is all the processes involved in transmitting and receiving information between individuals inside an organization. Some of these aspects refer to the implementation of channels and technologies that enable a flow of bilateral communication, such as Intranets, emails, newsletters, etc. 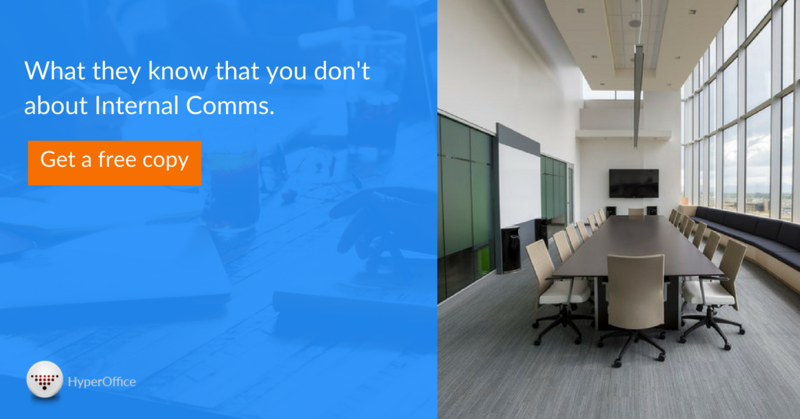 However, as many IC professionals suggest, Internal Communications go beyond updating and curating content for a corporate Intranet —or any aspect related to technology. It is meant to encourage an environment of understanding between management and the staff that enables collaboration and engagement. A psychological safe workplace, for instance, makes easier for the IC team to inspire and actually deliver a consistent message; if the employee doesn’t care about a mission or its peers, it doesn’t matter how many emails are sent to him, or what kind of intranet the organization uses. After all, technology is nothing but a channel, it is the culture and behaviors that make the workplace a productive or stressful place. What Moz does to excel in internal communications? Churn rate is a key metric for tech startups; it stands for the percentage of customers leaving you each month. And this is especially critical when tech companies must keep the growth rate stable. If your churn rate, for instance, is 5%, and need a monthly growth of 3%, you actually need to reach at least at 8% to keep your growth rate and regain the number of customers you lose each month. Rob suggested the subscription cancellation process could be more complex; customers would need to call through the phone to cancel their plans, and, in the mid-time, the company could understand why they’re leaving or offering a down-sale. Even though this could easily bring a positive impact on churn, it would be making the cancellation process more difficult intentionally. It is not empathetic, which lashes out directly against Moz corporate core values. Rand shares Moz’s core values represented in the acronym TAGFEE—Transparency, Authenticity, Generosity, Fun, Empathy, and Exception, which never go after business goals. They shape the guidelines of every action the company takes, whether it is hiring, firing, creating policies, meetings, marketing or Internal Comms. Being consistent with the values across any aspect of the internal communications of the company encourage employees to be truly engaged with the content they receive. In his book, Lost & Founder, Rand tells how he managed to hide a personal affair that was affecting his performance at work: he didn’t. He told his team what was going on, and as a response, the Moz team shared a giant hug that made him feel safe—psychologically safe. While there’s a stereotype of leaders being fearless, unwavering individuals that let personal problems outside the professional scope, it can lead to depression, bad habits, impostor syndrome, and at the end low performance. On the other hand, as mentioned before, Psychological safety is the most consistent predictor of team performance, over experience, expertise or IQ, suggesting that how teammates treated one another through the right norms and procedures leads to a rise in group’s collective intelligence. Has important technical skills that help him/her advise the team. 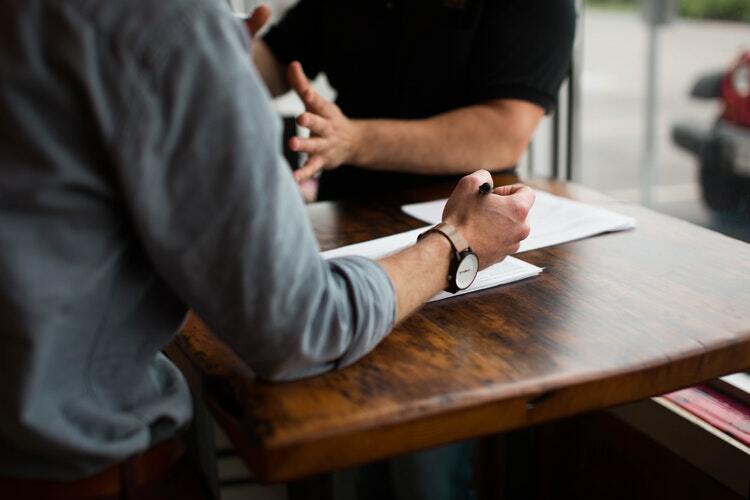 If you take these 8 behaviors into consideration for your internal communications programs, you can expect higher engagement and better performance. For instance, you can add these behaviors as priorities for your training and development programs, or they can be the guidelines for the content is shared on your intranet. As you see, technical skills are the least important factor for great managers, according to both Google and Moz. It’s not that they don’t matter, but other skills are more crucial. So, how does Moz proceed to not making management the only ladder employees can climb? They took Microsoft and Google as good examples. 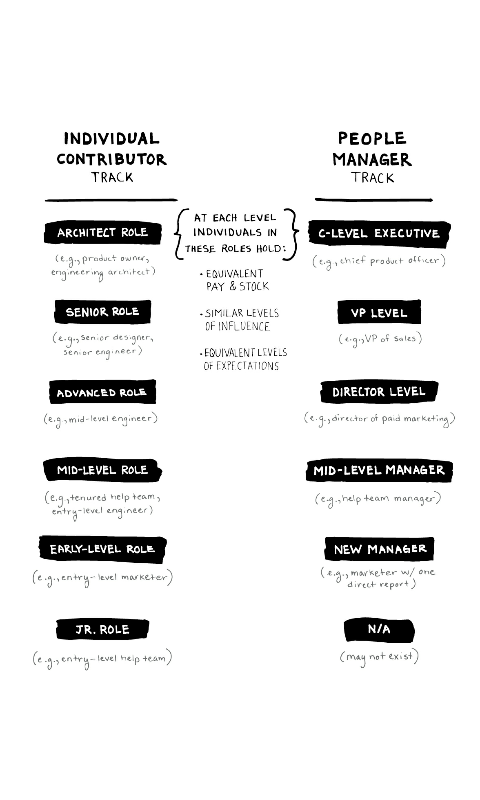 In their structures, junior engineers can move up the ladder of promotions, salaries, benefits, stock options, and influence, without necessarily becoming a people manager. Source: Lost & Founder, 2018. Inviting or mentioning individual contributors for strategic presentations, documents, external public communications and reports. Rand closes this chapter by suggesting companies to think outside vertical growth in terms of people management. He also believes in a horizontal structure where deep technical experts work as advisors and the overseers of projects while working with people managers. The post Internal communications best practices (Lessons from Google & Moz) appeared first on .